Everything that you want in an inflatable paddle board is everything that the Navigator has! The best part about it? Its price! It’s not too cheap to not be taken seriously, and yet, it’s not outrageously expensive that most people will dismiss it in a heartbeat! It’s priced just right! Now, we don’t need to convince you iSUP lovers about the benefits of an inflatable board. You should already know they’re light weight, easy to maintain, a breeze to pack, and the portability convenience is unmatched! All this, the Vilano Navigator has! 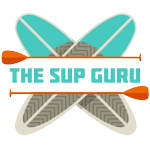 True to its name, it’s an all-round SUP that will have you navigating every nook and cranny of your local waterways. From the ponds, lakes, and even the Gulf, no sea span will be left inaccessible by you, except for class III rapids of course! For those types of irregular waves, you might want to spend triple the price! 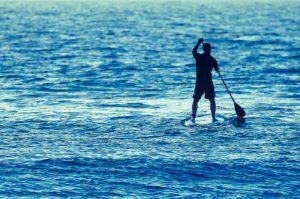 Instead of spending extra cash on a solid-body SUP and a special rack for your car, you can simply deflate the board for easy stowing and towing. To help make that process easier, Vilano includes a hand pump, 3-piece paddle, removable fin, carry bag, and a shoulder strap! It’s made with high-grade PVC with Korean drop-stitch construction – virtually indestructible! With 6 inch thickness, an over-sized diamond-groove traction pad, and a sporty design, you’ll be supping right through supper tonight! This is definitely priced and built for the recreational, all-round SUPper! If enjoying a day at the lake, whether you’re young or old, sounds like something you’re up to, then this is the board for you. While it’s an excellent beginner board for smaller newbies, the 6 inch thickness makes it suitable for any adult who wants to hop on board and take it for a spin. Just don’t forget to avoid those class III rapids! The Vilano Navigator is an extremely new iSUP! It’s barely seen the light of day in the market, but already it’s proving to be a home run with its buyers. The fair price might have something to do with that! One of the most favorite advantages of this board is that it’s actually easy to inflate! While many iSUPs may tend to be difficult and laborious to get up to half PSI levels, it’s fair to say that you won’t break a sweat with this one. But, if you’re a beginner, you might want to work on some bicep strength to get used to it. While there are literally no complaints about the Navigator, the included d-rings on the side for hooking the shoulder strap can get in the way when paddling. Seriously, when that’s the only complaint so far, you know you have a winner! The Navigator can cater up to 250 pounds. If you want to double up with more than one person on board, ensure you’re not taxing the iSUP by pushing weight limitations. What are the Vilano Navigator Board Dimensions? Fully inflated, the iSUP is 10 feet long, 31 inches wide, and 6 inches thick. The 6 inches makes a huge difference for larger users, whereas conventional iSUPs are only 4 inches thick. What are the Criss-Cross Straps on the Board Deck? It’s an on-board bungee that’s secured down, and in each corner it has extra d-rings to hold anything you want to take with you while out on the water. What are all the Accessories that comes with the Navigator? It comes with a plethora of nifty accessories. The board deck is already outfitted with multiple d-rings, you get the removable center fin, and a shoulder strap. You can also expect a back pack, patch kit, and valve wrench. This is all in addition to the board, pump, paddle, and PSI gauge. 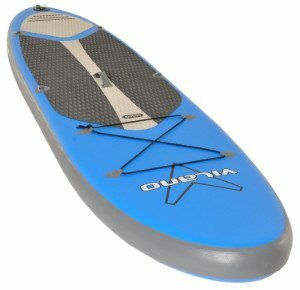 Is the Aluminum Paddle Adjustable? The paddle can be broken down into three pieces and is adjustable for users of various heights. It’s fully adjustable, meaning that it can be set at any height from 65.5 – 86 inches long. Do you have to Deflate the Vilano iSUP? Many iSUP owners keep their boards inflated to eliminate laborious inflation. However, it’s best to keep it out of the elements and stored safely. But, deflating the board, at least down to 3 PSI, will be easier on the seams, maximize storage space, and is the most convenient option for portability. Does Keeping the Board Inflated Between Uses Eliminate Future Inflation? No! You should always check the PSI level with the gauge every single time before hitting the water. Even if you keep it inflated between uses and the board holds air well, you might need to top off and check for safety purposes. What is the Size of the Board when Deflated? The Vilano Navigator is ultra-compact. When fully deflated, it’s only 3 feet by 1 foot (diameter). Super nifty for tight storage spaces. If you’re not quite ready to spend in this price range, the sibling to the Navigator might be more attractive. The Vilano Journey iSUP is a tad more affordable but you’d be compromising on the size. It’s a little smaller with only 5 inches of thickness and is just barely under 10 feet long. However, it still sports the same features and accessories as the Navigator but can only handle 240 pounds of maximum weight. Check out here. Neck and neck with price, build, and functionality is the Aqua Marina Fusion iSUP that sure looks like a breed of its own. It’s about the same build size as the Navigator and even has a 6 inch thickness, but it features double-wall drop-stitch core material. The heat-embossed EVA deck with honeycomb grooves sure looks “grippy”. However, complaints of air leaks in one form or another seems to be a not so popular, growing pattern. Check out the Fusion here.